… mini fruit mince pies…. 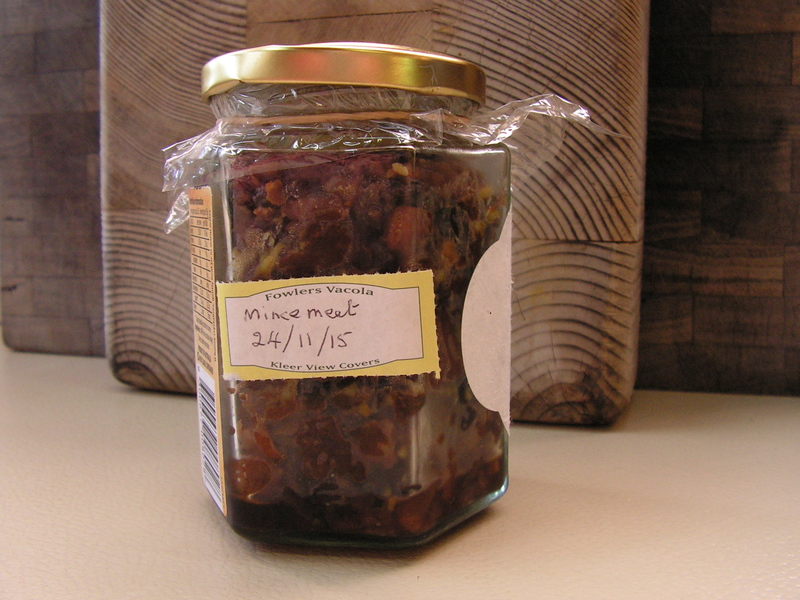 …to make Christmas Fruit Mince Pies! 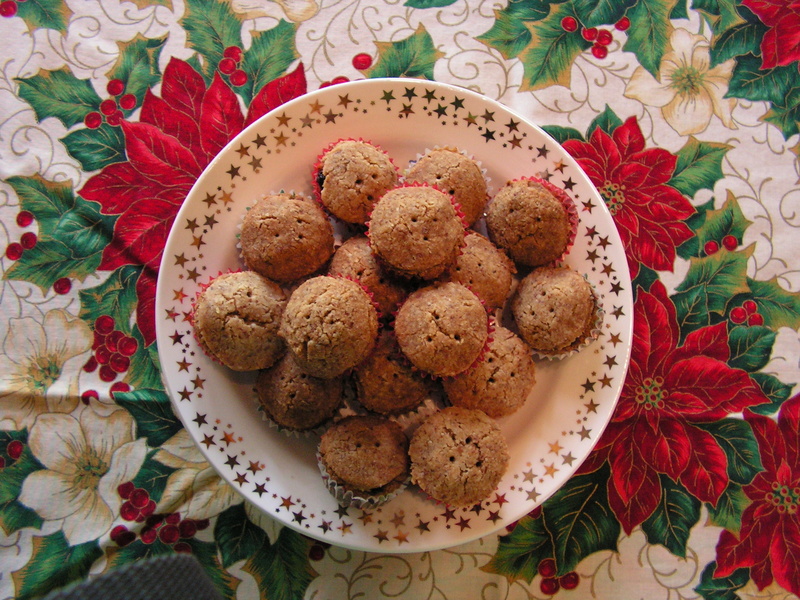 I love Christmas food… don’t we all?… but most of it is off my diet, so over the last few years I’ve tweaked a few recipes to make my own Niquie-safe versions. These mini mince pies are one of my favourites. They are very rich, so you only want to make them small (this, I discovered by trial and error), and they fit beautifully in those little mini-muffin cases. This year I am experimenting with ‘natural’ almond flour, that is, almond meal that has been ground with the almond skins on, and I have split the quantities to add 1/2 cup of coconut flour. I’ve also added a teeny amount (very scientific measurements) of ground spices, just to add a certain piquancy to the flavour. Talking of piquancy, I’ve also used a gorgeous macadamia oil that has been infused with lemon myrtle. Measure out and mix the dry ingredients thoroughly. Since sieving natural almond flour is rather beside the point, I crushed any lumps of flour or bicarb between my fingers as I mixed. Pour in the honey and oil together, and mix it all together with a fork or a spoon. Check consistency. I added a bit more oil, possibly due to the ‘natural’ nature of the almond flour. Knead gently to form a smooth ball, then pop it into the refrigerator for about half an hour to firm up a bit before you start rolling out. Knead gently to ease it out, then roll between two pieces of baking paper. At this point, I discovered, it is easiest to use a small cutter to determine the size of your bottom pie case, then just roll it into a small ball and squish (another example of scientific terminology) into the mini-muffin case, using your thumb to create a sizeable dent in the middle. If you want, you can ease a neatly cut circle into place, but I decided this was getting a bit fiddly. Spoon in your favourite fruit mince to fill the dent (I use my Mum’s home made mince, but you do have to make this in advance for the flavours to have fully seeped into the mix). Cut a tiny circle from the dough to make a ‘lid’ for each of the pies – I use a vodka shot glass that I somehow ‘inherited’ from our older children when they left home. Very handy. And I poke some holes in the top with a toothpick. Of the pie lid. Not the shot glass. Bake for about 15-20 minutes at about 180oC. Think about popping a piece of baking paper over the top to prevent burning and be prepared to let it cook a bit longer if necessary. The art of cooking with almond flour is a lesson in flexibility. As far as Christmas traditions go in our family, when I was growing up the mince pies were for celebrating Christmas Eve, generally taken with a smidgen of dry sherry (or ginger ale for the kids), usually after attending a vigil service at church. I still do this with my Mum, but it isn’t quite the same here in Australia, because we rarely (okay, never) have to trudge through snow to get to the church… and then I drive home, so I don’t partake in any alcoholic beverages at this stage. I usually have a tot of fine whisky (a fine single malt for preference) when I get back to Seventy Seven Acres, along with another mince pie with Matt and Will. After all, Christmas is all about family. Christmas Fruit Mince Pies are also brilliant for Afternoon Tea on Christmas day, if you still have any room left after Dinner, or any time during the day at all really, especially on Boxing Day when nobody ever eats proper meals but spends the day grazing happily on leftovers. 1 cup raisins, I cup sultanas, 1/2 cup chopped (pitted) dates, 1/2 cup (or more) mixed peel*, dark honey (about that much – mm – several dessert spoons full?) or dark brown sugar, if you prefer, whisky to taste (a good slosh – sorry, getting all scientific again), a half to full teaspoon each of ground cinnamon, cloves, cardamom, ginger, nutmeg or any other spice that you like… and you can add a goodly spoonful or two of your favourite marmalade, too, if you feel so inclined. And some chopped almonds or walnuts can be a nice addition, although the pies are very nutty as it is. Put it all in a bowl and mix it all up (a very quick whizz in a food processor is okay, but VERY is the operative word, or you get mush not mince), then transfer to an airtight container and leave in a cool, dark place for at least a week to develop the full flavour. Mum recycles jam jars and hands them out to interested rellies. Whilst this is not strictly according to my diet, Mum goes all out to make it as Niquie friendly as possible and I tell myself it is only once a year. Although the mince does keep quite well in the fridge, so I usually have some left over ready for Christmas in July (mmm…you’d have to be Australian [or possibly from some other country in the southern hemisphere] to understand). Wishing you a wonderful Christmas full of love and peace and joy… or, if you don’t celebrate Christmas, wishing you a happy holiday season with pretty much the same sentiments. This entry was posted in food and cooking and tagged food, fruit mince pies, recipes on December 22, 2015 by seventysevenacres.